Here’s the top 6 tips Christel shared in our interview. The success we’ve seen from Kade & Vos is not the result of pure luck. They made a deliberate choice to make their brand easily accessible and highly visible in multiple ways – you can learn from them and apply them to your own business. For starters, Christel doesn’t worry about the small size in her business in her search for PR coverage. “Don’t ever turn down an opportunity to talk to someone,” she says, “because even though it might be in a small college paper, that’s an audience, and there will be a ripple effect.” Even if you are short on time and swamped with tasks, making time to speak to people who reach out to you is a critical way to stay relevant and continue to grow. Kade & Vos has a full-time, in-office staff of only three people, and yet they have found the time to both launch their business, earn coverage and talk to the public. On their website there’s an entire section of materials for the press, ranging from a simple, ready-made press kit through highlights of their coverage and a fast-track for media inquiries. Christel knows that she is tied to her email, so she makes sure that it’s front and center “so that people have a direct way to connect with me.” The NYT reporter—who specializes in entrepreneurship—had heard about Kade & Vos and knew about Christel’s academic background. Before leaving her post, to found Kade & Vos, Christel was a professor at Washington State University. Fueled by her hunger for knowledge, she still immerses herself in academic literature, with a particular focus on fat studies. Citing recent evidence that shifts science away necessarily correlating high body weight to poor health, she noted, “What makes someone unhealthy is their behavior.” She is always ready to speak to this—and the press noticed. 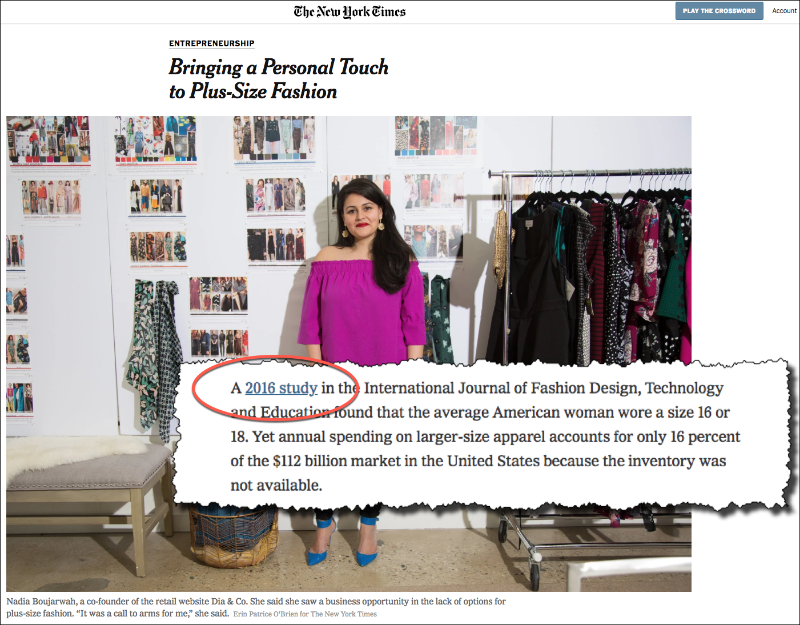 The New York Times was just one of the stories resulting from Christel discussing her academic expertise. But even if you don’t come from academia, confidently using your work experience or interests will make you an expert in something. Check out our plans and pricing – big savings on annual subscriptions! 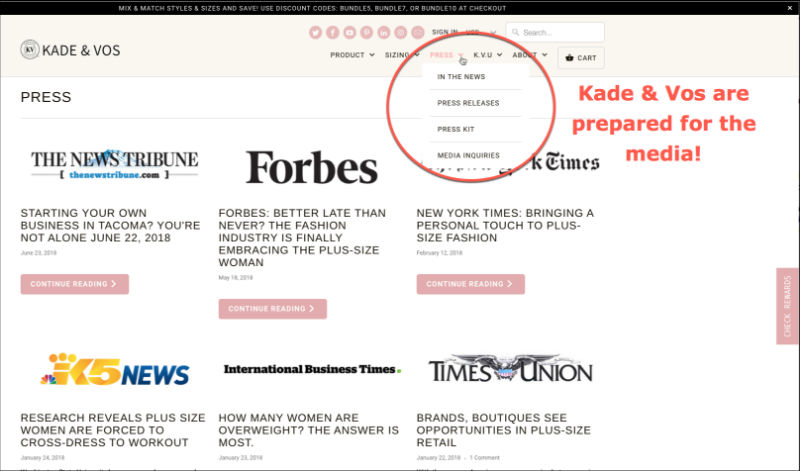 The Kade & Vos’ team keeps up to date by reading all they can—everything from the news all the way through peer-reviewed studies—and finding ways to connect over what they read. 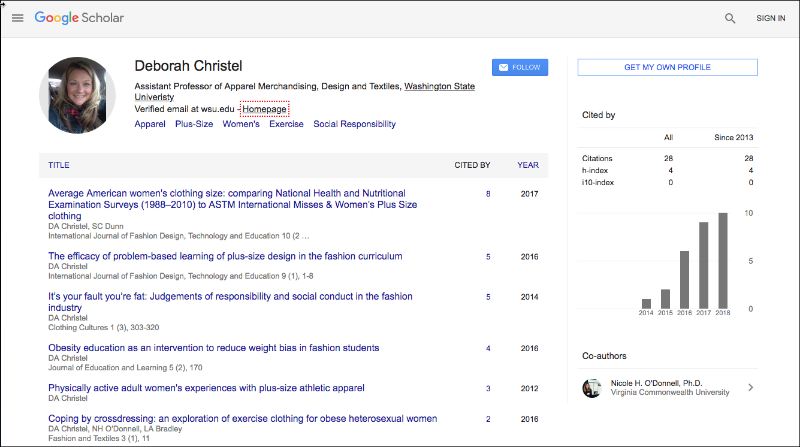 Having an up-to-date Google Scholar profile has been an easy way for Christel to participate in academia and maintain a presence that highlights her interests and expertise. Kade & Vos has developed the healthy habit of listening to their public, with one of their key metrics being the number of comments they receive on social media. By being aware of what needs exist in women’s fashion and society’s notions of appearance and body image, and specifically how this relates to their audience, they can position their messaging exactly where it needs to be. The company can facilitate and guide these very conversations to lead back to their own brand and products. Don’t limit yourself to conversations in your own vertical, rather reach out and connect with others. Local business experts can share press contacts and can help spread the word about your company. Christel kept in touch with the office as Kade & Vos approached its launch date, keeping them abreast of developments and in return receiving relevant press contacts. Christel encourages everyone to connect with other local businesses or start-ups and learn from their experiences, tools, and stories. After all, there’s always something you can take away and apply to your own business life. But, she warns, “During any ‘networking,’ don’t make it about yourself or your business. Make it about everybody else.” This is a way to organically grow community, which in turn helps you increase brand awareness and facilitate publicity opportunities. Don’t be afraid to spend a bit on getting some extra help with your PR and social media, as a little investment in an expert can go a long way. This helps the team focus on being where they need to be to grow out the business while also making sure that they maintain enough of a social media presence to sustain brand awareness. Final words: Love your brand! While it may not be surprising that this professor is finding some success through experimenting, what stands out with Christel is her awareness of those around her. This feeds naturally into how she connects with anyone she’s speaking to. She’s clearly very aware of her brand and loves to talk about it, but she’s always in tune with what the people around her want to talk about—whether a reporter, an obesity expert, or a random person on Facebook, she always knows her audience. Many businesses get hung up on constantly trying to identify new perspectives or “the next big thing,” which can feel so daunting they give up or don’t really start their social media or PR efforts. While there plenty of lessons to take away from Kade & Vos’ success, the biggest takeaway is to never stop engaging. No matter what links or mentions you earn, buzz about your brand will always keep you connecting with new people—the very people who will spread the word about you, and ultimately who will buy your products. Andrea Pretorian is an experienced digital marketer and customer success expert who loves project management, linguistics, and a job well done. She's managed content strategy at agencies as well as for clients worldwide ranging from start-ups through enterprise-level companies.